If I hadn’t been there to witness it, I probably wouldn’t believe this story was true. In my limited common sense, I’d decided to take Goon with me to Borough market in the hope he would like the cool stuff there and perhaps even buy something other than ostrich for a change. I was also hoping to teach him where all the stalls were so I could send him shopping one Friday lunchtime. But Goon wasn’t as impressed as I hoped he would be. He followed me around but didn’t pay much attention. He had some fun prodding some headless rabbits by the Furness game stall but lost interest after a few minutes. I didn’t complain too much at his apathy. It was useful to have him there. It turns out that being accompanied by a 6ft 5 tall Goon, who is dressed like a hit man, makes the crowds get out of your way VERY quickly, which is a rather useful thing in Borough on a Saturday afternoon. I didn’t get the response I expected. “Huh? Cheese? Where’s the cheese?” I pointed towards the other side of the market.Two seconds later, Goon was gone. I tried to follow, but without Goon’s ’dangerous’ look, I was stuck, moving at a snails pace with the rest of the crowd. Fifteen minutes later I found him standing behind the counter of an Italian cheese stall. I wondered why the farmers had taken him back there. I was not happy when I found out. One of the farmers was gesticulating enthusiastically around a large cheese, looking very, very smug. “…and then you cut it in half again…. and wrap this bit up very tightly….” he paused as I joined them behind the table. ”You a friend of his? I hope you like Gorgonzola.” My heart sank. I couldn’t believe it. Goon had been out of my sight for fifteen minutes and he already managed to buy twelve kilos of one what was possibly the stinkiest blue cheese in the world. My stomach turned as I thought of the tube ride home. The farmer heaved the cheese onto the weighing scales, which clearly were not designed for something of that size. “Well, that comes to… £98.43.” My jaw hit the floor. “Tell you what, give me £100 to make it easy and I’ll give you this goats cheese and throw in two of these too. He handed me a bag of what what appeared to be a buffalo milk cheese. On the way home, Goon was being very protective of his cheese. I don’t know why. Who in the world would try to steal 12kg of gorgonzola from a leather-clad giant? The cheese was so stinky that, even though both Goon and I live in Hammersmith, I got the sudden urge to leave the train at Green Park, a good four miles away from my destination. When I eventually got back to Goon’s and he opened the door, I was actually overwhelmed by the stench of cheese. Without a garage or a cellar, Goon had decided to store the gorgonzola in his living room. As I’m sure you can guess, the other residents weren’t best pleased. Fortunately it turned out that the cheese wasn’t going to be there for much longer as Goon was going to give it to his dad as a birthday present. 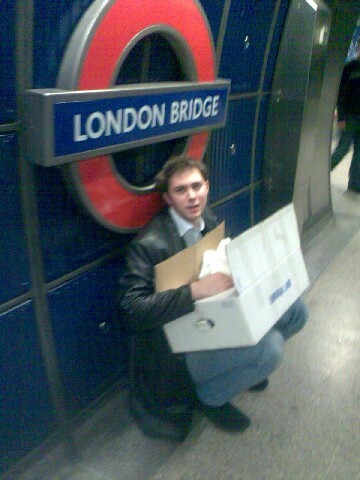 So Goon’s poor father is probably at this moment carrying a twelve kilo cheese on the train from London to Leeds. I suppose the upside is he’ll get a carriage to himself! I think that, when I make a journey to Borough Market, I should avoid asking Goon what he’d like. This is because he always says the same thing: bloody ostrich fillet. Yes, I do like ostrich fillet. It is gorgeous stuff but, since it is so expensive (about £10 to feed the two of us) I feel the need to do something really exciting with it whenever we have it. To begin with this wasn’t a problem, but now we’ve had ostrich lots of times and I’m running low on inspiration. I think this is a shame. It is a waste of the great flavour of ostrich. After all, we don’t generally use beef as a lamb substitute or vice versa, so why is ostrich used as a beef substitute? Since lamb and beef have fundamentally different flavours, I would neither sub beef into a classic lamb dish, ike roast lamb wiht mint sauce, nor top lamb with a port and stilton sauce. The same goes for ostrich. For some reason, not many people feel the same way, which is a shame because ostrich has a beautiful distinctive flavour. True, it bears a passing resemblance to beef (especially when overcooked) but the flavour is lighter with a sort of gamey ‘kick’ to it. I think it is rather like a cross between duck and beef but a little sweeter than either. It was the beef and duck flavours I had in mind when I made this dish. I knew that duck is frequently served with wild mushrooms (an idea which quite appeals to me) and I’ve had beef fillet in brandy-cream sauce many times already. A combination of the two sounded like just what I needed for the ostrich. Now I know I’ve mentioned that ostrich is a very dark meat. I think it’s about time I qualified that statement. See? Very, very dark! And not all that appealing in that state. To turn it from that slug-like object into something very tasty, only two minutes of pan-frying per side (on the highest hob setting) are needed followed by about 5 minutes of resting in a warm place wrapped in kitchen foil. This really is a meat which is best eaten rare. I made the sauce for the ostrich by gently frying half a finely diced onion with a minced garlic clove until soft then stirring in about 40g dried wild mushrooms that had been soaked in boiling water for about 10 minutes. Then I added about 100ml double cream, a little soaking liquid from the mushrooms and about 50 mls beef stock. I let this reduce until we had a nice thick sauce then added a big slug of brandy which I had flambÃ©ed in the pan I used to cook the ostrich. I served the steak topped with the mushroom sauce alongside some wild rice and sauteed green beans. This dish suprised me so much! I thought I’d seen the best of ostrich, but I was wrong. The flavours here were great. They complemented the ostrich’s beefy flavour without overwhelming the sweet gaminess. I was very happy indeed and can thoroughly recommend this combination. One thing to note is that is important to use a reasonable brandy for this - nothing too expensive but definitely not ‘cooking brandy.’ It is the only way I’ve been able to get brandy sauce to work, cheap brandies seem to make the sauce lose its flavour pretty quickly. Scene: Goon is making himself a snack of grilled calamari and is getting out some baking foil to put it on. BLONDE FLATMATE: Can you put kitchen foil in the microwave? GOON: This says aluminium kitchen foil. Putting metal in the microwave is bad. BLONDE FLATMATE: Is aluminium foil made of metal? Goon likes his blonde flatmate. She makes him look very clever. Oh no! I’ve become stuck in a duck with fruit rut! The one exception to this was the spontaneous curried duck but I was very drunk when I made that, so I’m not sure if it counts. In desperation to get out of this dangerous habit, I went looking around the internet for ideas. It seems that most of the world was ALSO stuck in a duck with fruit rut. There are a few recipes for duck with port but even they seems to involve cassis. There were some red wine reductions suggested too but, meh, boring! beautiful bright pink rhubarb. It had been ages since I’d cooked with it. The last time had been in a rhubarb crumble I made about three years ago. I imagined the tanginess going really well with my duck and to make it even better, rhubarb isn’t a fruit, it’s a vegetable, so i would be out of the fruit rut! The only problem I could see was that Goon didn’t like rhubarb and, let’s face it, it isn’t as easy to disguise as figs are. Later on at home, Goon was looking very suspiciously at the rhubarb. ”Rhubarb’s sour!” he said. Apparently there’d been bad childhood experiences with rhubarb crumble. So I did what I thought best, and ignored him. Looking through my cupboards, I found a few chunks of stem ginger to add to my rhubarb compote, which turned out to be remarkably simple to make. I simmered the rhubarb, ginger and a sprig of rosemary together in some cider with loads of sugar until the rhubarb was soft. Then I poured off the excess water and removed the rosemary. Finally I pan fried the duck breasts to rare (well, verging on medium this time perhaps) and served them with the compote and sides of some asparagus sauteed with garlic and gratin dauphinoise. Yay, pink! \o/ The crazy pink colour of the compote was enough to get Goon to try some. The gingery flavour alonside the tanginess was enough to keep him eating it. Who needs artifical colours and flavours when you’ve got stem ginger and rhubarb? It was lovely with the duck and the creamy dauphinoise was a really good accompaniment. We washed it all down with an equally pink and slightly sweet Californian rosÃ©. I’ve decided to put this up for weeked herb blogging, which this week is being hosted by Ed at Tomato . So, to make it educational, here are some interesting facts about rhubarb. Apparently rhubarb wasn’t eaten before the 17th Century, when sugar became readily available to most people. I guess that makes sense: it’s pretty damn sour by itself. It contains a fair bit of oxalic acid, which in high doses is a neurotoxin, although you’d have to eat about 5kg of rhubarb leaves (or even more of the shoots) to have any harmful effects. There’s still enough in rhubarb stems to strip your teeth a little though! The rhubarb bought at this time of year is ‘forced’ to grow out of season by increasing the temperature around the plant. This is done by covering the plant with an upturned bucket. Forced rhubab is more tender and more brightly coloured than that grown in season. 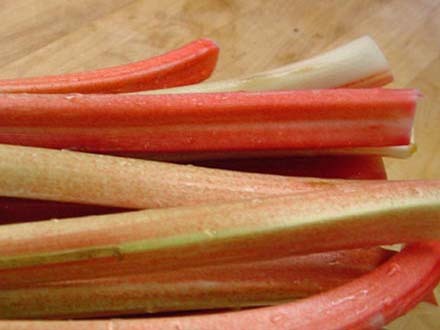 Traditionally, this first rhubarb of the year is grown in the ‘Rhubarb Triangle’ of Leeds, Wakefield and Morely. And, quite annoyingly, even though rhubarb was always considered a vegetable in the past, this changed in the 1940s. When the plant was exported to the States, the confused officials didn’t know how to classify it. They decided it should be classified on how it was eaten. So I guess, technically, if I’d eaten my compote in America, I would have been eating a fruit and I’d still feel stuck in a rut. For once, I’m glad I’m in England! …..when this happens to you. I was cooking a chinese meal at Goon’s the other night and was busily stir-frying some vegetables, when one of Goon’s flat mates walked in. This girl is a ‘Value’ addict - and I mean ADDICT. Pretty much everything she buys is of the blue stripey label variety or similar smaller store versions. “REALLY?” Poor girl was obviously confused. A fairly long silence followed. And she shuffled off, apparently a little embarrased. I could read this in two ways. I’m a genious cook who can make salted rice taste amazing. Eating Value products on a daily basis is so utterly hideous that plain and simple things like rice boiled in salt water taste fantastic in comparison. As much as I’d love to believe point 1, I have to accept that it probably is the value effect. So the lesson for today is: If you’re bored of what you’re eating, here’s a simple solution. Go Value for a week and then you’ll find everything you cook after that tastes amazing. What? You don’t know rampeh leaf? I guess that’s OK. I didn’t know what it was until a few years ago, which is quite embarrassing given my Sri Lankan heritage. 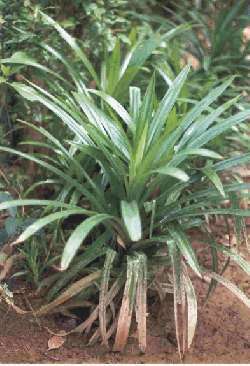 Rampeh, otherwise known as pandanus amaryllifolius ,or screwpine, is a tree that grows in South East Asia. They can look pretty damn bizarre as they’ve got roots that stick out into the air, like a mangrove tree. The leaves have a very distinctive smell, which is caramel-like and nutty, and for this reason they’re cultivated and used to flavour food. I mostly come across rampeh in Sri Lankan cookery, although I’ve seen it mentioned in Thai and Indonesian recipes as well. Usually, a few inches of the leaf are tied into a little knot and fried up with spices in the early stages of making curries. Before this week, I’d never cooked with rampeh before, mostly because it’s a bit of a nuisance to find in Britain. You need to go to a specialist shop and even they seem to run out of it reasonably quickly. But, oddly enough, Dad had come across a shop which stocked loads of the stuff, in Paris of all places! So he brought home a load and I took a few leaves for myself, in time to use them for Weekend Herb Blogging. 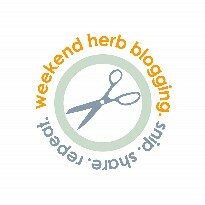 Since everyone in the world apart from me already knew what weekend herb blogging was before Scott at Real Epicurean decided to host it, I don’t there’s any point in me saying much about it. If you don’t know about it yet, then get with it already! Start by reading this post at Kalyn’s Kitchen and Scott’s post here. Anyway, since I conveniently had my rampeh, I thought I’d take the opportunity to make a authentic (hopefully) Sri-Lankan chicken curry. I did this a few months back, long before I got the hang of this photography business. I didn’t have rampeh then, so it seemed a good dish to try to find out what difference rampeh really made. My parents make a load of Sri-Lankan curry powder in one go to save time. I don’t make Sri Lankan curries often enough to do this so I tend to do enough for the one curry I’m making that day. 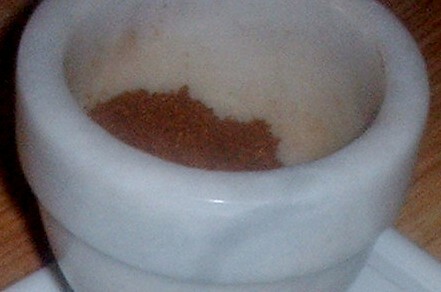 The spices above (cumin, mustard, cinnamon, cloves and cardamom seeds) are dry roasted in a pan seperately until golden brown to enhance their flavour and then ground together into a fine powder. In that picture there should also be fennel and coriander seed but Goon was still rooting around in the cupboards for those when I took the picture. The powder you get is much darker than normal curry powder from the local store. The roasting gives it this deeper colour and also enhances the flavour and aroma. So now to make the curry. I used skinned chicken thighs and drumsticks for this because, wherever you go in Sri-Lanka, that is what the chicken curry is made from. I have NO IDEA what the hell they do with the breast and wings, but I’ve certainly never seen them in a genuine Sri-Lankan curry! The recipe for the Sri Lankan Chicken Curry (Kukul Mas) has been here for ages. I tweaked it just now to include the rampeh. Serve it with kiribath (or string hoppers if you’re lucky enough to have them) and curried lentils or vegetables. The verdict on Rampeh: There was a definite difference in flavour between the curry without rampeh and this one, but it’s very hard to describe. Nuttier maybe? I don’t know - the flavour is so unique. Anyway, it was a GOOD flavour. So, my rampeh leaves have now gone in the freezer until the next time I want them, along with some nice looking curry leaves that I’d used to make the lentil side dish for this meal. I’m actually scared by how much that curry looks like the chicken I’d find in Sri-Lanka. Particulary the dodgy ones you can buy from the little roadside “hotels,” which are damn tasty but tend to leave you bathroom-bound for a few days after. Fortunately there was none of that with this meal… just tasty, spicy chicken and lentils with creamy, garlicky kiribath, washed down with a nice medium Riesling from Jacob’s Creek. Up until now, Goon has always insisted his steaks are cooked for longer than mine. I think that’s probably fair considering I tend to take the ’show it the pan’ approach to cooking certain meats. But with tuna, this is no longer the case. Goon now likes his tuna seared and it’s all to do with this fab Ramsey recipe. It’s a classic really, seared tuna in a mustard, honey and soy coating with crushed black peppercorns pressed into the fish, served with braised and caramelised chicory. If you happen to have the book ‘Secrets,’ do try this recipe. It is really delicious and doesn’t look too bad either! One thing you may have picked up from reading this blog is that, in spite of the fact I like to design things in pink, I am NOT what you’d describe as a girly-girl. As you know, I’ll eat pretty much anything. Liver, kidneys, hearts and cute fluffy animals all appear on my table on a fairly regular basis. Sometimes said animals haven’t been properly jointed or gutted, and I’ll happily reach in and pull out whatever needs removing. This has caused a small problem when I’ve been cooking for Goon at his flat. Goon tries a bit harder to keep her happy. A recent scenario went as follows. The girl walks in as Goon had finished jointing a rabbit and was putting it in the freezer. GIRL You’re lying aren’t you? GIRL Oh my days! EEEEEEEEEEEEEEEEEEEE! I’m afraid that, when this young lady is around, I have to fight very hard to keep the opinionated sod inside of me quiet. I mean, come on. Animals have blood! She eats animals! I don’t really appreciate someone who eats intensively reared pork and poultry on an almost daily basis telling me that it’s disgusting to eat game (I don’t have a problem with people eating intensively reared meat - just this girl’s inconsistency). Then again, she’s the kind of person who probably thinks the breadcrumbed chicken breaststeaks she eats were grown in a petri dish somewhere free of any skin, bones or bodily fluids. I’m sorry, I didn’t mean to go off on one. The whole point of that little rant was so that I could tell you how the special name for this lovely stew came into being. I was looking for something to make for the new blogging event, ‘Waiter, waiter, there’s something in my……. . This was dreamt up by Jeane at Cook Sister!, Johanna at The Passionate Cook and Andrew at Spitoon and Spitton Extra. The first event is all about stew and Andrew is hosting it. I decided I wanted to make a venison, or similar rich game stew since its nearly the end of the season and I had a couple of ‘affordable’ bottles of port lying around after Christmas. I found a pack of mixed game from Manor Farm Game, which seemed to be mostly venison with some rabbit and pigeon. I thought it would be great stewed up with a rich port sauce and lots of wintery spice. So, my stew was simmering away in Goon’s kitchen when Miss Squeamish arrived back. She commented on the smell in kitchen (it did smell fantastic ) and asked me what I was making. I wasn’t particularly in the mood to deal with a squealing idiot so I half mumble something about game stew, hoping to God she’d bugger off. She didn’t quite hear me and enquired again. By now, a vague memory had crept into my mind of something James and Kirsten’s dad said to wind up his daughter many years ago. I knew I shouldn’t say it. But I couldn’t help myself. I had just enough time to exit the kitchen before she procesed what I’d just said and a 150 decibel scream EEEEEEEEEEEEEEEEEEEEEEEEEEEEEEEEEEEEEEE! filled the entire building. 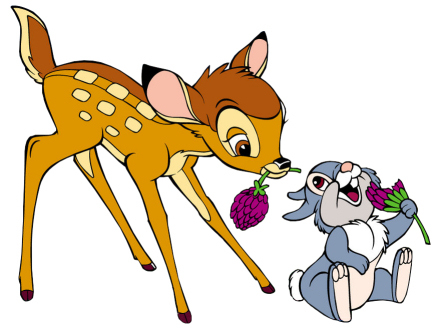 So that’s how my dinner for that night was christened Bambi and Thumper stew. Waiter, waiter there’s something in my stew! It appears to be a couple of cute and loveable Disney characters. Now for the important bit: the recipe for Bambi and Thumper Stew. It’s a dish I have made a few times but the recipe is always part improvised. Here’s how I did it this time. This feeds one Goon and one of me, or three people with normal appetites. The day before you want to eat the stew, take 450g of diced Bambi, Thumper and/or other assorted game and marinate it in a mixture of ruby port, red wine, half a small, finely diced onion and 1 sprig of rosemary. I used about a 50-50 mixure of port and wine. About two and a half hours before you want to eat, slice the other half of the onion into thin half-rings and sautee it gently in butter with 3 tsp allspice, 1 tsp ground cinnamon, seven or eight crushed juniper berries, the leaves of one sprig of rosemary and a couple of sprigs of thyme leaves. When the onion is nearly soft add a couple fo handfuls of sliced chestnut mushrooms. When the veg is cooked, turn up the heat and brown the meat in the pan, then strain in the liquid from the marinade. Stir in a tablespoon of redcurrant jelly, a few squares of 80% cocoa chocolate, add a stick of cinnamon and a couple of bay leaves and top up with beef or lamb stock. Bring this to a very gentle simmer (as gentle as you can get it) , cover it and let it stew for about one and a half hours, until the meat is juicy and tender. Take off the lid, add a tablespoon of cornflour paste and let the stew reduce and thicken for 20 minutes or so. See, easy! And very very tasty in a port-soaked kind of way! The meat was beautifully tender with extra richness from the port and warmth from the cinnamon and allspice.I served it with lots of creamy mashed potato and a full bodied fruity red wine. The girly-girl better watch out this week. I’ve been to Borough and I have a whole octopus! Why oh why did I start cooking for a Goon? Last night I was making a nice stew (more on that later ) and I was running a bit short on rosemary, cinnamon and garlic, so I called Goon and asked him to pick some up. Goon arrived with the cinnamon and garlic. There hadn’t been any rosemary in the shop. That was ok, I was expecting the little Tesco Metro to not be too well stocked. What I wasn’t expecting was to have all this dumped in front of me. I have more herbs than I could possibly use before they all go off. We don’t even have any freezer space. Goon still hasn’t learnt that rosemary tastes substantially different to things like tarragon and coriander. It seems I need to give him more kitchen training. I guess I didn’t get through the last time he did something like this. The parsley would be useable if I didn’t already have another massive pack in the fridge. I see a fair number of pestos and herb crusts being made in the near future. Anyone know what to do with a huge pack of dill when you don’t have any fish? When I’m supposed to be marking, I faff around making things like this instead. This is a really delighful dish of venison, named after the region it originally came from: Baden-Baden in Germany. The recipe was very kindly translated for me by ‘BlackForestJules’ on the BBC food boards who happens to live in that area of the world. I had bought a venison haunch steak that I was looking to find a new recipe for. As usual the internet was yielding very little and I was feeling a bit uninspired but I remembered that dish had been mentioned on the message boards so I went looking for it and then Jules translated a version for me. Skin the saddle of venison. Rub the meat with salt, pepper and the juniper berries. Cover with the smoked ham. Preheat the oven to 180 C° (top and bottom heat). Put the venison into a casserole and put into the oven for 30 mins. Add the sour cream and put back into the oven for 15-20 mins. In the meantime, peel, half and core the pears. Rub the cut side with lemon juice and cinnamon. Stew the halved pears until they are soft, but take care so they don't fall apart. Take the venison out of the oven and put it on a serving platter. Check if the sauce needs seasoning and pour it over the meat. Arrange the pears around it, cut side up, and fill a dollop of redcurrant jelly into the hollows. Serve with SpÃ¤tzle (broad, fresh egg pasta is nice with it, too, though), Brussels sprouts or other seasonal veg. I altered this slightly to suit my haunch steak. Instead of roasting the meat, I griddled it until rare. I fried up some bacon to put in with the cabbage that I used to accompany the dish and added the pan juices from both these meats to some sour cream for the sauce. I ended up using some beef stock in the sauce too. The pears were done in the same way as the recipe suggests but, as you can see I messed around with the presentation a little. I wanted to try making spaetzle but it was a Sunday evening and the small stores that were open didn’t have any eggs, so that was out of the question. It had to be fresh tagliatelle tossed with lots of butter and parsley instead. Like I said, I spent lots of time faffing with the presentation, which was a bit annoying because as soon as Goon got his plate, he just dumpled a load of tagliatelle over it and started munching. His looked prettier than mine too! Anyway, this is a great way to serve venison - I really recommend it. Tenderloin or saddle would be even better to use if I could afford it, but for now I’ll just have to stick to whatever I can buy!